Leopard Frog use to be a common specie of frogs found in every province and territories except of Yukon. It’s a medium sized frog specie that can reach up to 11 cm but in usually between 5-8 cm in lenght. Leopard frogs colour morphs can go from green or brown frog with large, light-edged spots from which came it’s name of leopard. 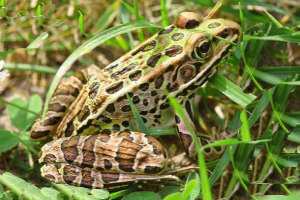 The specie of Leopard frogs found in Canada is called the Nortern Leopard frogs due to it’s more northern distribution. Leopard frogs in a wide range on habitats and can be found in permanent ponds, swamps, marshes and slow moving water throughout forest, open and urban areas. Leopard Frogs feeds on a wide variety of prey, mainly consisting of insects, spiders and other small invertebrates and are predated by reptiles like snakes and turtles, birds like herons, other frogs and by mammal such as raccoons and humans. The breeding seaon occurs at mid-late spring. Female lay up to 7000 eggs attached to submerged vegetation. The eggs hatch in 1 to 3 weeks depending on the temperatures. Tadpoles transform into froglets during the summer and end of the summer. Leopard frogs population are declining since 1970 in western Canada and this decline is thought to have been caused by pollution and habitat loss. The Leopard Frog is designated as an endangered in British Columbia, Special Concern in the north and the prairies (Northwest Territories, Alberta, Saskatchewan, Manitoba) and are not classified at risk in eastern Canada including Quebec and atlantic provinces..